To painters, atmosphere has two meanings; the emotions conjured up by the image you are creating or the effect of the weather on the scene. 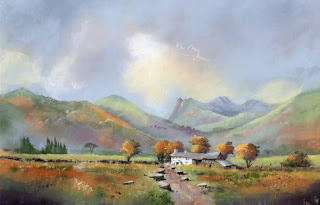 In this painting of Little Langdale the esoteric atmosphere I was trying to create was of an isolated farmhouse, surrounded by the mountains, abandoned and slowly decaying, there are no animals, the roof is beginning to sag and the wilderness is returning to the fields. All is not lost though, the roof is intact. Perhaps someone will make it a home once again. You can read more about this aspect of painting and many other tips in my book, Painting with Pastels, published by Search Press. There is also a DVD of the same name to accompany the book and a special offer on the two together. This entry was posted in atmosphere, Jenny Keal Blog, painting, pastel painting, recession by Jenny Keal. Bookmark the permalink.